Valle Crucis are a band from South Carolina that plays a very raw and blasphemous form of black metal and this is a review of their self released and self titled 2017 ep. Heavy yet melodic riffing starts off the ep along with some drum beats a few seconds alter and after awhile grim black metal screams start to make their presence known while t he tremolo picking also gives the songs a more raw and old school feeling and when t he music speeds up a great amount of blast beats can be heard. Throughout the recording you can hear a great mixture of slow, mid paced and fast parts along with a perfect mixture of both old school and modern influences and one of the tracks is long and epic in length while the guitar leads a re done in a very melodic fashion when they are utilized and they also bring in an instrumental track while always keeping everything in a very heavy and raw direction. 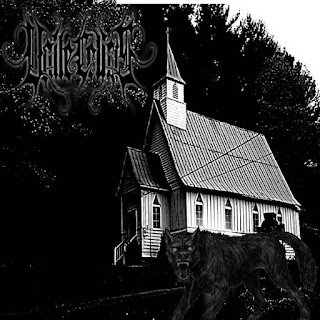 Valle Crucis plays a style of black metal t hat is very raw, blasphemous and traditional sounding, the production sounds very dark and raw while the lyrics cover blasphemous themes and legendary stories. In my opinion Valle Crucis are a very great sounding raw and blasphemous black metal band and if you are a fan of this musical genre, you should check out this ep. RECOMMENDED TRACKS INCLUDE "The Hellhound Of Valle Crucis" "Blasphemous Perversions" and "Winter's Whore". 8 out of 10.